The first really good snowstorm here in Anchorage, Alaska happened EARLY Thanksgiving morning. Armed with some ideas and better technique, I went out to see what snowflake photos I could capture. Here are the results. Please let me know what you think. As the Alaskan winter progresses and we get additional snow, this gallery of macro snow crystal images will continue to grow. This year's collection currently numbers 45 crystals, but the weather report seems to indicate more are on the way. :) Please have a look and don't forget to leave a comment! YES! I do sell prints of these snowflake images. These prints have been very popular and look stunning in a grouping of three or more on a wall. Print size is 8" x 8" with an actual image size of 5.25" x 5.25". Unframed prints are $25 and matted & framed prints $50. Framed prints come in a matte silver metal frame with a single blue gray matt. Blank greeting cards are also available at $3 each. Orders can be processed through Paypal. Send me an email at ajstudio@alaska.com with your order, and I'll send back a Paypal invoice. Or we could just do it the old fashioned way, with a personal check. Thanks for looking! 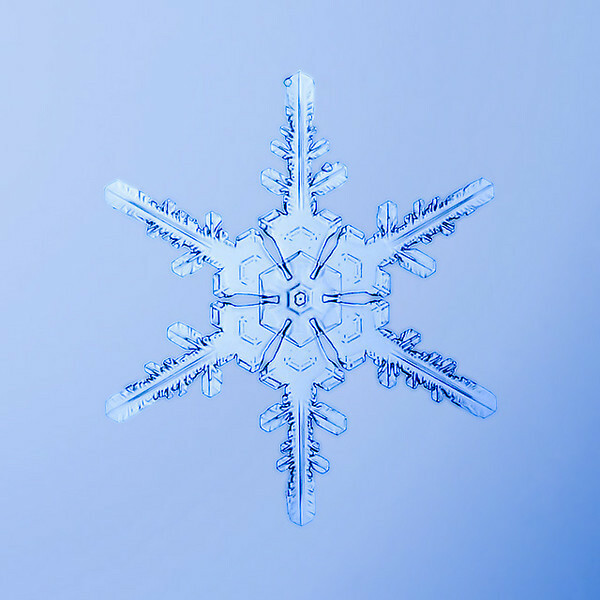 Be sure to check out the snowflake photos from other winters. Click on the Snowflakes link above to take you to the other galleries. All images copyright © 2007 Andy Sorensen. Use of photos without express permission is prohibited.